Seven years ago my family rescued a beautiful Siamese cat. She was severely abused by her owners and they left her at a pet boarding place claiming they were going out of town. After weeks of waiting it was clear they were not coming back for her and she was put in the shelter. When I saw her for the first time I was amazed. She was an older cat so nobody wanted her, and it brought tears to my heart when they said she was scheduled to be put down in the next twenty-four hours. I did not hesitate - my family and I adopted her. She puked all the way home due to the meds they gave her. At the time we didn't know what breed she was. She was listed at the shelter as a Siamese mix, and it was not until a year later that we found out she was a Lynx Point Siamese. A nice vet told us. She is the queen of the house, and so loving. She may be old but she acts like a kitten. She is also very vocal. When we got her she was lighter but with old age her hair has darkened. We still don't know what color she would be classified under. 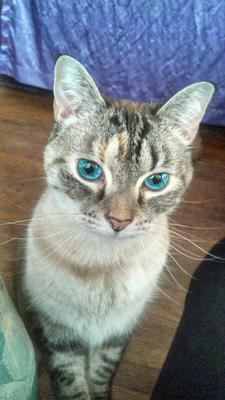 Flower is a beautiful cat, Kaylee - thanks so much to you and Donna for sending in her story. She has the most amazing and quite unusual eye-color - such a wonderful bright turquoise in that first photo of her. Rescues and shelters generally classify any Siamese-type cat as just 'Siamese mix' because that's all they're officially able to say. If a cat has Siamese characteristics there are always some Siamese genes in that mix somewhere, but most cats who wind up in shelters don't come with pedigree or registration papers, and most are mixes of some sort. But we can look at the point colors and markings and come up with a reasonable description. She's certainly a Lynx Point, because of her stripes, and because her markings and coat are so dark I'd say that colorwise, she's a Seal Lynx Point Siamese. It always amazes and saddens me that so many beautiful cats are mistreated and end up in shelters (or worse), but well done you for taking her and giving her a loving home. As you've discovered, rescued Siamese-type cats generally have so much love to give and it's great that she settled in so quickly and so well with you when she first arrived. So sorry for your loss, I know the feeling. I lost my 16 year old Blue Point Nov. 30. Lilee was a charmer and I loved her dearly. I still cry when I read The Rainbow Bridge. I now have a Lynx Point Siamese. She is very pretty but I can't get Lilee out of my mind. She was such a talker. She wowed them at the vet clinic with her talking. 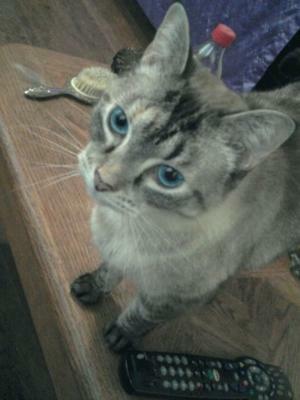 She was so pretty with her big blue eyes. My new female had been named Nutmeg which I am trying to change to Sheba. I guess she will grow on me. Time takes care of much. There is a bridge called the Rainbow Bridge connecting heaven and earth. Beside it there is a land of meadows, hills, and valleys. When a pet dies, it goes to this place, where it has food, water,and sun. All animals, who were old or ill are restored to health. They all run and play together, although they miss their someone special. One day they stop and look into the distance. You have been spotted. The two of you cling in joyous reunion. The happy kisses rain upon your face as you look once more into the trusting eyes of your pet, so long gone from your life, but never absent from your heart. Enjoyed reading @ Flower. I just adopted a kitten who is a Lynx Point Siamese. He provides much joy and companionship! Looking for feline play companions for him! Thank you to everyone who followed Flower and commented. Sending hugs and kind words. It's still hard to believe she's gone ... my heart hurts but she gave me unconditional love and a great 17 years. She's not suffering now. I never wanted to be selfish but I didn't want her to go. Thanks to all of you, love your fur babies, it's so rewarding and full of love. Thanks Susan, Caroline and everyone who took the time to read her story. Even though I am broken-hearted I'll look for her all the time, just her very presence. I don't think I can ever love another fur baby like I did Flower, she was so much more than my best friend. It is seriously a loss in the family. I knew the day would come, just not so soon to me 17 years. Thank you all. I'm so sad that your love for Flower made her want to fight longer 'cause she knew she had a better life. She was a very pretty cat and you can see she had a good home. Know that everyone on here who got to read your story on her and follow her may have felt she was part of everyone's life. Again sorry for your loss of Flower. It's been the worst couple days in my life. Flower passed away on 1.18.2018. She had been sick. She got pneumonia, the vet gave her a shot and antibiotics, but she was dehydrated and at 17 the vet said there wasn't any more he could do for her. I brought her home determined that she would be fine - despite what he and everyone else said she was a strong girl and a fighter and I loved her too much to think of letting her go. She did get better but a month later it got worse, and we held her as she passed. I told her it was OK to go - I would be OK and didn't want her to suffer. It's like she needed to hear that because after a long fight she let go. She knew how much she was loved and was with all of us. I can't imagine how life will be without her. We are heart broken. I love your cat. I have the same cat as yours. If you want to find her on here, here is the link: My Sasha, And The Things She Does. These cats love to do some funny things. I have moved from where I was but still live in BC, Canada. One day I was playing with her and throwing her plastic balls with bells in them. She has a blue one, pink, yellow and a green. She ran to get the yellow one and brought it back carrying it in her mouth. If you stop playing with her she will make sure you're not watching her as she tucks the ball under the sofa. Then what she does is meow until you help look for it and if you can't find it then you throw the next one, and when she hides that one, the next one as well, so I have the last one and this time I'm watching her where she hides it ... yes under the sofa. If I sit down she has her arm around me and loves to bite my necklace. I have taken it off my neck and put it round her and then the fun begins as she rolls around trying to get it off or just jumps up in the air. You will have endless fun with her and the love she gives back. So glad you saved her and now she has some loving moms. We adopted a lynx point from a shelter and her name is Chaos! Donna is my mom and Kaylee is my sister - my mom told me about this website and I finally found it. Flower likes to lay on phones, magazines and pretty much everything you don't want her to lay on. She sneezes a lot and she loves Donna. She loves attention and she is a hilarious fluffy cute lovey member of our family. I love your caring heart. I too rescued a kitten Lynx point (also informed by a vet). I named her Suki. She is now almost 4. She has the very distinct personality of the stand-offish Siamese to everyone but me. And she is very protective of me and her territory. I love the breed. I'm glad to update that Flower is still doing great! The years are showing, and she lives to be lazy and her favorite place is sleeping on my belly or back. She has been such a big part of my life and my girls' lives I can honestly say she saved me in so many ways I couldn't imagine life without her! Reply from Caroline: Donna, I'm so pleased to hear that Flower is still doing well. Thanks for dropping by to update us! I just got myself a lynx point Siamese as well. When I got her the girl said she got her from a rescue pet place and she was a kitten at that time. She didn't even have a name so I named her Sasha. We were told she is about 1 year old. She follows us from room to room and loves all the attention she can get. She will lay there with her paws closing and opening like she is trying to knead - she does this all day long but we love her. I wish I could post a picture of her so all can see her. She loves her name and will either lay beside me or on top of me or even hang out on the back of the sofa. And yes she does meow a lot. I had another chocolate point Siamese and had him for 9 years. We got him as a kitten as a feral cat and he passed away in March of this year 2015. I miss him so much but I have a picture of him on my desktop and see him every day. Love your cat! Reply from Caroline: Good question, Kim, and you could be right; sometimes it's difficult to tell. 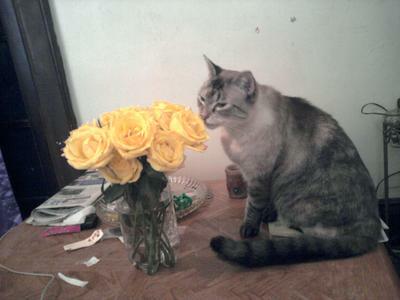 Flower (being a rescue, and therefore probably a Siamese mix) could have all sorts of genetics going on. Here in the UK at least, tortie/tabby (tortie/lynx) is a real classification, so there *is* such a thing as a tortie/lynx, but I think Flower looks more lynx point than tortie/lynx. I could be wrong though.